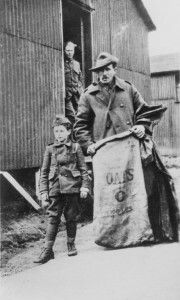 Waiting to return home at Hurdcott Camp, near Fovant in 1919, Number 4 Squadron of the Australian Flying Corpshad a surprising secret which attracted much publicity. In Germany, shortly after the war’s end, they had taken in a French orphan boy who had travelled there from Lille with various units of the British forces. Since there were no living relatives to take the boy in, they smuggled him back to England in a kitbag and took him to Hurdcott Camp, where he was spoiled by everyone. The boy, named Henri, was nicknamed Little Digger. When the Squadron sailed for home in May 1919, Henri was smuggled onto the ship – this time in a hamper – by a mechanic with the Squadron, Tim Tovell, who, upon discovering that his own son in Australia had died from influenza, had decided to adopt him. Sadly, Henri was killed in a motorcycle accident in Melbourne in 1928.